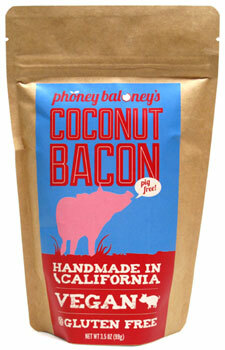 Phoney Baloney’s is the world’s first manufacturer of vegan and gluten-free Coconut Bacon! This piggy-less, cholesterol-free bacon substitute is perfect for snacking, sandwiches, salads and so much more. Make that perfect BLT or Elvis (peanut butter, banana and vegan bacon) sandwich, give your favorite greens the best topping, and it even works great in your baking recipes – imagine smoky bits incorporated into your favorite cupcake recipe for a unique twist on ordinary treats. Your creativity and imagination are the only limits to what you can do with this amazing vegan bacon alternative! 3.5 oz. package is $5.29. From lana bean of Wakefield, Michigan on 1/11/2018 . At first I was questioning this stuff, since there was a little coconut smell more than bacon smell. But okay, it's coconut, right? Then I tried it...amazing! Salty, crunchy... Similar to bacon topping for salad., but here the ingredients won't scare you! At first I was questioning this stuff, since there was a little coconut smell more than bacon smell. But okay, it's coconut, right? Then I tried it...amazing! Allergen This item is manufactured in a facility that also processes coconut, soy, wheat, nuts, eggs, and dairy.